The University of Florida's Grant Holloway had a weekend. It's hard to say what's more impressive -- that the sophomore broke the collegiate record in the 60m hurdles in 7.42, or that he defeated the former record holder and reigning world champion Omar McLeod in the race, who set the prior record of 7.45 three years ago. They raced at the Clemson Tiger Paw Invitational on Friday night. We'll just leave this right here. @Flaamingoo_ power level....ITS OVER 9000!!!!! Holloway's time is the 11th-fastest in U.S. history and ties for 20th on the world all-time list, according to the University of Florida. You don't often see the emotional side of the sport in quick highlight videos, but the Gators' SID captured Holloway's full reaction on film. "Grant's an emotional guy, kind of like his coach," Gators head coach Mike Holloway said in a post-event interview. "The biggest thing was, [the record] was one of his goals, something he really wanted. And if you know Grant, well, you know that when he goes after something, once he accomplishes it, it's a big weight lifted off of him. He appreciates what he did. 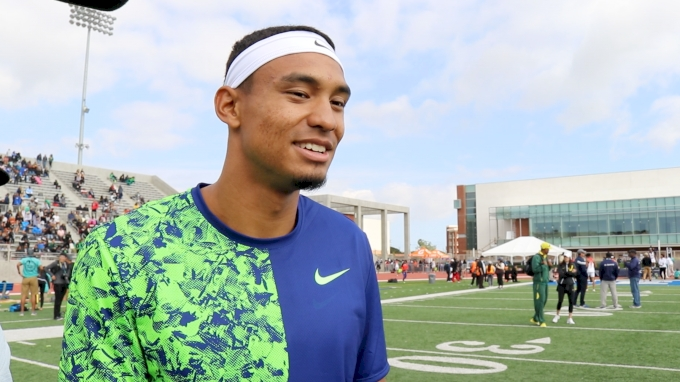 He's the fastest collegiate hurdler ever and that's something special." Grant, who won back-to-back NCAA titles in the 60m hurdles and 110m hurdles as a freshman, also revealed that the accomplishment meant more because he had surgery over the summer. USC sophomore Mike Norman and Auburn sophomore Akeem Bloomfield bizarrely clocked two of the fastest indoor 400m times in collegiate history while competing in separate heats at Clemson. Norman won heat 1 in 45.00, the fifth-fastest time in NCAA history, then Bloomfield followed in heat 2 with an NCAA No. 6 all-time mark of 45.02, which is also set a new Jamaican national record. Norman broke and Bloomfield tied the facility record of 45.02 set last year by Texas A&M's Fred Kerley. The run was a nice indication that Norman should be poised for his first blockbuster indoor campaign. This was actually his collegiate debut at the indoor 400m, as he was hampered by hamstring issues last year and did not compete during the indoor championship season. Norman and Bloomfield placed fourth at fifth, respectively, in the 400m final at the 2017 NCAA Outdoor Championships. The top returner to that event is Bloomfield's Auburn teammate Nathon Allen, who has run 46.68 this season. Holloway and Norman were also key cogs in the Gators' and Trojans' 4x400m relays, which made history on Saturday night at Clemson. The quartet of Kunle Fasai (46.08), Holloway (45.12), Chantz Sawyers (45.67) and Benjamin Lobo Vedel (45.36) broke Texas A&M's one-year-old collegiate record of 3:02.52 in 3:02.23. Unfortunately, so did the Trojans -- who set a world record mark of 3:01.98, thanks to Zach Schinnick (46.28), UCLA transfer Rai Benjamin (44.63), Ricky Morgan Jr. (45.72) and Norman (45.35). Here’s the wild anchor leg from the second-fastest 4x400 in COLLEGIATE HISTORY, and fourth-fastest of ALL-TIME! The U.S. indoor record is actually a bit faster, 3:01.96, but the time was not ratified as a world record by the IAAF. The USC men should actually thank their female teammates for that record, as the Trojan ladies set the tone in the 4x400m relay with their own blazing facility record of 3:27.56. Kyra Constantine (52.96), Anna Cockrell (52.26), Deanna Hill (52.24) and Kendall Ellis (50.11) combined for the fifth-fastest mark in NCAA history, which is not much slower than the collegiate record of 3:27.03 they set last year at NCAAs. The women's rivals, the Oregon Ducks, moved to No. 2 on the NCAA descending order list with a 3:30.18 win at the Don Kirby Invitational in New Mexico. If you were wondering how the Ducks' relay would fare this year without new pros Deajah Stevens and Raevyn Rogers, the answer is just fine. Their line-up this season includes Texas A&M transfer Briyahna DesRosiers, sophomores Hannah Waller and Makenzie Dunmore and true freshman Shae Anderson. Watch the Ducks' 3:30.18 race here. I mean, are you surprised? The phenom known as Sydney McLaughlin made her collegiate debut in the 200m with a runner-up finish in the 200m to USC All-American Deanna Hill, 22.82 to 22.95. Those are the two fastest times in the NCAA this year, which puts McLaughlin's rankings in the NCAA descending order lists as No. 2 in the 200m, No. 1 in the 300m, No. 1 in the 400m and No. 5 in the 4x400m relay with her Kentucky teammates. The time is also apparently one of the fastest-ever for an Under-20 athlete. In Clemson, @GoSydGo has clocked 22.95 over 200m. It's the fastest indoor 200m by an U20 athlete for 10 years and puts her fourth on the world U20 indoor all-time list. And she's not even a 200m sprinter... she's a 400m hurdler! McLaughlin rarely ran the 200m in high school, though she did clock an outdoor PB of 22.96 in her senior year. Before this weekend, her indoor PB was 24.00. For the last few weeks, we've written about how Missouri's three-time NCAA champion Karissa Schweizer looks poised to do some big things this winter (here, here and here). That's obviously still true, and she's already earned herself a collegiate record in the 3K, but the road to an NCAA title is not going to be easy -- especially after her rivals turned in star performances themselves this past weekend. Elle Purrier of New Hampshire dropped three seconds from her mile PB to run 4:26.55 at the BU David Hemery Valentine Invitational. She's now two seconds ahead of Schweizer's No. 4 all-time mark and a little more than half a second from Jenny Simpson's 4:25.91 collegiate record. 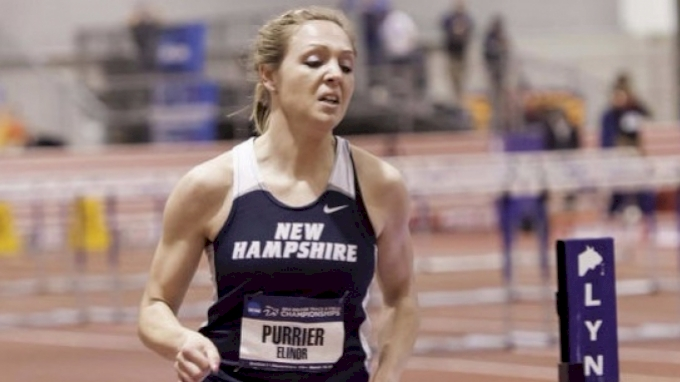 Purrier has placed second and third the past two years in the mile final at NCAA Indoors. Can she take home the win as a senior? 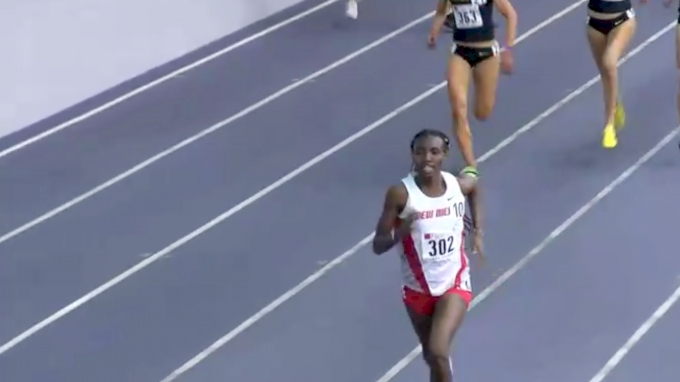 We weren't sure what to think of New Mexico's Ednah Kurgat skipping out on the opportunity to race the Millrose Games 3K, where Schweizer set her collegiate record. But concerns over her fitness appear to be unfounded as she confidently disposed of a stacked field at the Husky Classic 3K with a time of 8:57.47, a new Lobos school record and third-fastest in the NCAA this year behind only -- you guessed it -- Schweizer and Purrier. A total of five women broke nine minutes in the race, with Jessica Hull of Oregon, Lilli Burdon of Oregon, Vanessa Fraser of Stanford and Allie Ostrander of Boise State sneaking under the barrier. Just how deep was this race? Stanford's Elise Cranny, a four-time NCAA runner-up, was 11th in 9:06.24. Also, shout-out to the Ducks' Judy Pendergast, who had a lot of mileage on her plate this weekend at Husky -- in addition to what I'm sure was a long run on Sunday. The sophomore, who transferred from Harvard this year, ran 16:44.53 in the 5K on Friday night and 9:36.36 in the 3K on Saturday. The top collegiate in the Friday night 5K was Colorado's Erin Clark, who ran 15:37.64 to finish third behind pros Emily Infeld and Gwen Jorgensen. Clark's time is the fourth-best in the NCAA this season and second-fastest in Buffs' history behind only Simpson's collegiate record. Watch the Husky Classic Women's 5K here. On the other side of the country, defending NCAA 3K champion Dani Jones of Colorado competed as the sole collegiate entrant in the New Balance Indoor Grand Prix 3K, which was headlined by former Buffs Jenny Simpson and Emma Coburn. Simpson won the race in 8:40.31, and Jones was seventh in 9:05.23. And perhaps the deepest NCAA distance meet ever, according to Iowa State athletic director Jamie Pollard. NCAA history was made last night at Iowa State. 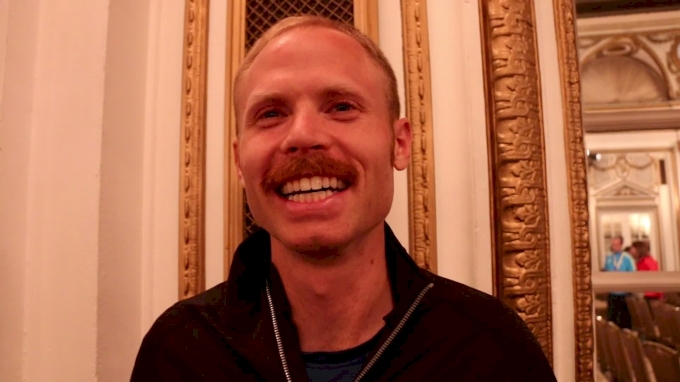 25 guys under 13:59 in the 5K and then 9 guys go under 7:59 in the 3K. The best part were all of them were collegians. It is believed to be the fastest collegiate distance meet ever in the history of the NCAA. Reigning NCAA XC champion Justyn Knight of Syracuse led 25 men under 13:59 in the 5K with a 13:39.59 win over Dillon Maggard of Utah State, who edged Alabama's Vincent Kiprop for runner-up honors in 13:40. 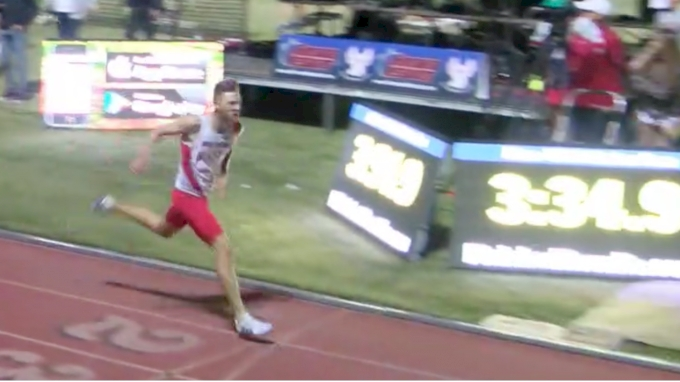 We should note, though, that Southern Utah's Mike Tate actually stole the NCAA leader out from under Knight a day later at the Husky Classic in 13:37.33. Watch the Iowa State Classic Men's Invitational 5K here. Watch the Husky Classic Men's Invitational 5K here. Easily the most exciting race, though, was the men's 3K that saw NAU's Andy Trouard outkick Stanford's Grant Fisher, one of the best kickers in the NCAA and the reigning NCAA outdoor 5K champion. They ran the NCAA's No. 2 and No. 3 times of the season, 7:48.21 and 7:48.56, as Illinois' Jon Davis also broke the 7:50 barrier in 7:49.92. Six guys were still in contention at the bell lap and well, you should really just watch the race video. Pollard's tweet is actually incorrect -- a total of 13 college men broke 7:59 in the 3K, not nine. The women's races weren't as top-heavy or deep, but still yielded impressive marks: Georgia sophomore Jessica Drop ran 15:43.28 in her debut 5K on the track, a new school record and seventh-fastest in the NCAA this year, as nine women broke 16 minutes; and Sharon Lokedi of Kansas clocked a 27-second PB to win the 3K in 8:59.69, which stood as No. 8 in the NCAA by the conclusion of the weekend. Watch the Iowa State Classic Women's Invitational 5K here. Watch the Iowa State Classic Women's Invitational 3K here. 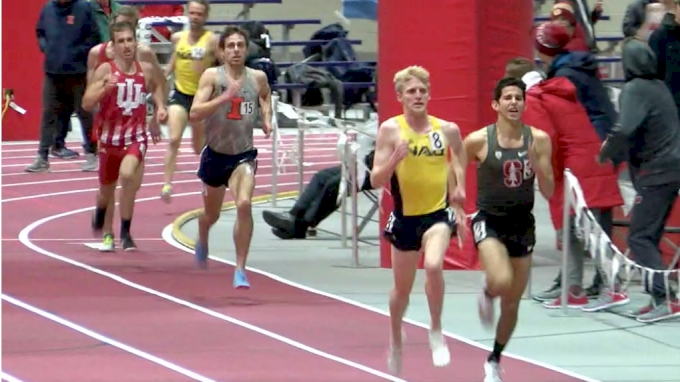 One of most thrilling --and, ultimately, toughest-- races to watch this weekend was heat 6 of the men's mile at the Husky Classic. No, it wasn't the fastest section at the Dempsey (that was heat 7, which saw nine men and four Oregon Ducks break four), but it was one of the most dramatic as Alex Rogers of the University of Texas executed a late-race kick to surge into the lead in the final 100m. As he kicks toward the finish line, you can see him eyeing the jumbotron to see his time and he ultimately crossed in 4:00.00. Watch the race video here. Rogers has run 4:01 outdoors the past two years in a row at the Texas Relays, and his prior indoor PB was 4:02.54. If it's any consolation, a sub-four can't be too far on the horizon. In the final section, Rogers' freshman teammate and training partner Sam Worley ran the first sub-four of his career in 3:58.04. Watch the fast section of the Husky Classic men's mile here, which Oregon's Sam Prakel won in 3:56.89. Speaking of Worley -- his former Texas high school rival, Foot Locker champion Reed Brown, won the duo's first head-to-head battle by finishing right behind Prakel in 3:57.23. As you can tell from this 2,000+ word article, NCAA indoor track and field is no longer heating up -- it's here. 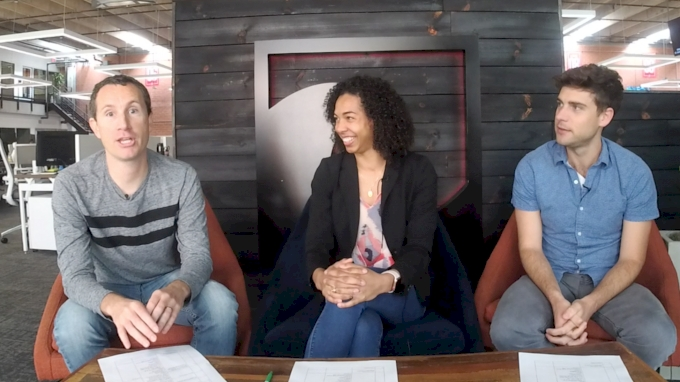 Next week, we'll look at performances from tune-up meets and analyze any college athletes who head to Albuquerque for USAs. Comments or feedback? Get in touch with reporter Johanna Gretschel by email at jojo@flosports.tv or on Twitter at @jojo_shea.